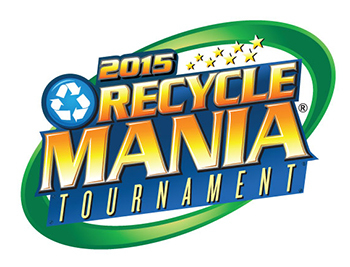 Syracuse University kicked off its 2015 RecycleMania Collegiate Recycling Competition on Feb. 1. RecycleMania is a nationwide event that raises awareness about reducing waste and increasing recycling. Last year, more than 6.3 million students and staff in 50 states, the District of Columbia and Canada participated in RecycleMania. During the eight-week campaign, over 89 million pounds was recycled or composted. This is equivalent to preventing the release of 126,597 metric tons of carbon dioxide. “Every time people recycle they are extending the usefulness of something that has already served a purpose. When an item is recycled, a new product is produced using the recycled material, versus having to use new material to create the same item, preventing pollution and destruction of virgin material like trees, metals and other raw materials from earth’s natural resources,” says Melissa Cadwell, marketing manager of the University’s Sustainability Division. “Each year we participate in RecycleMania, we want to increase the amount we recycle. With the help of the campus community, it would be wonderful to rank higher this year than last. This year, in addition to physically recycling, Syracuse University is also competing through Twitter and texting via 3R Actions competition. 3R Actions is broken into four stages, each two weeks long and each with its own theme Recycle, Reuse, Reduce and TBA. We will promote the competition through Facebook and Twitter. During the competition, the campus community can share texts or tweet messages that are counted toward the University’s 3R Action totals. We encourage all university members to join and help us win,” says Cadwell. Join me in @RecycleManiacs 3R Actions Challenge. RT when you #RECYCLE to support #SU & the planet! Kicking off @RecycleManiacs @ #SU. RT when you #RECYCLE to help us in the 3R Actions Challenge! Text to 21212 using #RM2015 #RECYCLE #SU to share actions via text. The following weeks, Feb. 15-28, March 1-14 and March 15-28 will be promoted via Twitter and Facebook. To learn more about RecycleMania, visit http://www.recyclemania.org.